Electronauts sits at an interesting intersection somewhere between game, experience, and tool. Your experience with Electronauts then may vary depending upon what you hope to achieve with it. If you’re anything like me—someone who can fall deep into music, but isn’t musically trained—you’ll find a totally unique and approachable platform for expressing your inner groove. Electronauts can be thought of as a virtual reality DJ tool, but it’s smartly design to be accessible by people who don’t know the first thing about DJing. 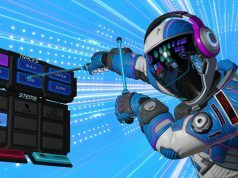 Each song in the game (40+ at launch, covering a range of EDM sub-genres) is effectively a custom-built music kit which comes complete with backing tracks, freestyle instruments, ‘sound grenades’ (for one-off percussion), and vocal segments (for some songs). Now, if Electronauts just threw all of this at me, I’d surely make a fool of myself, as I went into this knowing almost nothing about DJing. Thankfully, the game does a lot behind the scenes to make whatever you do sound decent. This is thanks largely to what Survios calls the ‘Music Reality Engine’: an underlying system that keeps all aspects of music in the game on rhythm and in tune. In addition to keeping all of the backing tracks and stems on beat, freestyle instruments shift your notes to keep them in sync (also called quantization). With the Music Reality Engine, and a concise tutorial built into the game, it didn’t take long before I began to understand what I could do with the tools in front of me and started stringing together satisfying sequences that had me grooving to the beat. After getting a feel for the basics and being able to competently direct the flow of a song, I started to appreciate the additional depth waiting beneath the surface. While the freestyle instruments (which usually come in the form of orbs) are fun to jam out with, you can also hold a button to record each time you hit the instrument, effectively capturing a small sample which will play repeatedly. When it comes to vocals, you can jump around between verses and even individual lines, offering a lot of flexibility to how the vocals will play out in your song. In the backing tracks you can mute individual instruments to create a different flavor, or mute the entire track at once to highlight a specific part of the vocals or an instrument solo. Each tool (instruments, vocals, etc), can be muted or unmuted at any time with a shortcut button, while the sound grenades (which you throw to trigger a noise) act as percussive exclamations. Once you grasp the capabilities of all the tools, you’ll have yet greater control over the sound and feel of each song, and it becomes incredibly satisfying to flawlessly plan and execute a perfect transition to a new part of the song, or to play a fitting freestyle solo. Even finding a way to bring a song to a natural conclusion can be a fun challenge that fosters a feeling of musical resolution. 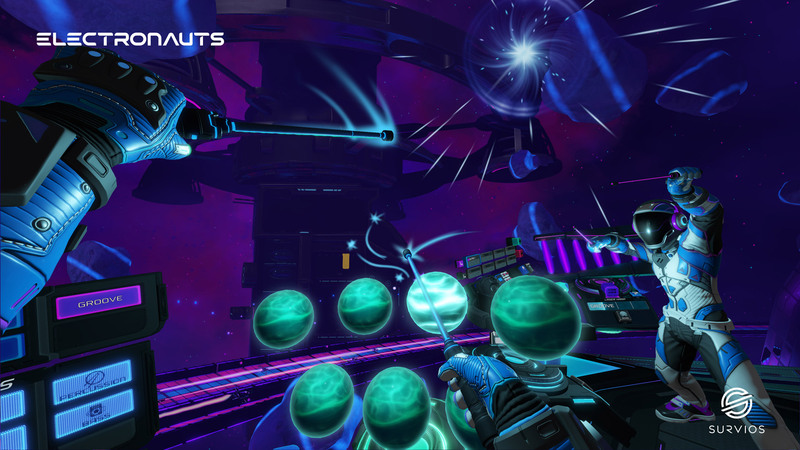 For musicians out there, Electronauts offers still deeper features, like the ability to turn off quantization for instruments, build song arrangements in advance (instead of queuing backing tracks on the fly), change the stems that accompany each backing track in a custom arrangement, and create interface layouts for quickly toggling between groups of tools (rather than switching one tool at a time). 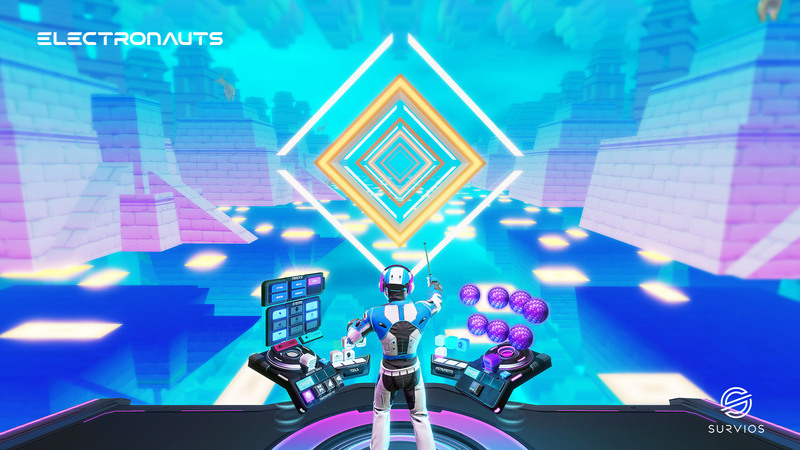 Electronauts feels highly accessible, but also like it could be used for real performances. This is reinforced not only by the deeper tools mentioned above, but by a strong set of in-game virtual camera controls that allow you to adjust what other people see. The typical first person view, as displayed on your desktop, is smoothed by default, so onlookers see something more digestible than the quick movements of your head. Additionally, the game offers a virtual selfie stick, an in-game camera and monitor which you can freely place anywhere, with the resulting view showing up on your desktop. There’s also an orbiting camera, which circles your Daft Punk-esque avatar as you rock out. To top it all off, there’s some visualizer controls, allowing you to adjust the color and speed of the background visualization. Of course, you can pipe the output from your desktop monitor to a streaming service or even a projector if you wanted to play in front of a live audience. All of the camera and visualizer controls can be adjusted on the fly as you are DJing, making it possible to put on a compelling show all by yourself. 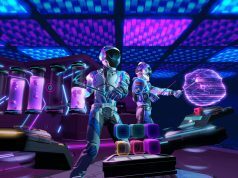 If you aren’t the type who wants to perform in front of a crowd, but you do happen to know a jam buddy with a VR headset, Electronauts supports multiplayer (on Rift and Vive only) for two players. This puts both of your avatars in the same space with access to the same tools, letting you DJ any track cooperatively. Electronauts offers cross-play between the Oculus platform and SteamVR. 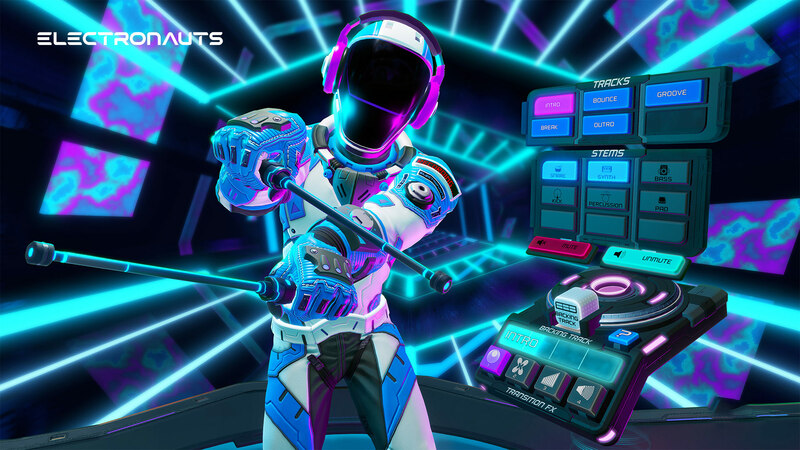 Electronauts offers a surprisingly accessible utility for achieving the feeling of DJing in virtual reality, but it goes beyond being just a tool by wrapping everything up in a thematic package that feels equal parts Tron and Daft Punk. The opening of Electronauts reveals you to be on a futuristic ship (powered by sick beats, no doubt) blasting through space. When you launch into a new song, your ship lifts off and ‘travels’ to the song. Transitioning between songs is seamless both audibly and visually, as your ship jumps to hyperspace before arriving at your new song destination. This ‘spaceship’ metaphor is but a setting—there’s no lore or objectives in Electronauts—but it does tie the experience together into a cohesive whole that never reminds you that you’re inside of a VR headset. That extends to the tools interface too, which has a surprisingly functional design which keeps things from being overcrowded while at the same time keeping everything within easy reach. There are interface lessons to be learned from Electronauts that extend far beyond musical VR games, but that’s something to explore another day. Of course it’s worth noting that your enjoyment of Electronauts, and how much you tap into the beat, will depend deeply on your preference in music. The game is wholly built around EDM, covering a broad range of sub-genres. Electronauts has you standing in one place, so there’s no need for any artificial locomotion, largely ensures things will remain perfectly comfortable. While you’ll occasionally see some full screen movement (like the visualizer background that’s constantly coming toward you), I never once felt dizzy or uneasy in the game, even after continuous sessions of an hour or more. The tools in Electronauts work well and are easy to understand. They’re all triggered in simple and intuitive ways without any unnecessary or uncomfortable gestures or hand positions. Importantly, the interface mostly keeps you looking forward rather than down, which greatly helps prevent headset-induced neck fatigue (due to the front-heavy nature of VR headsets). 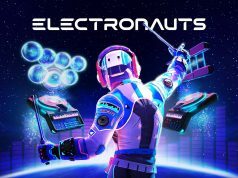 Electronauts' greatest achievement is perhaps its ability to translate untrained musical creativity into something that sounds good while maintaining the feeling of really crafting something of your own. The experience overcomes a familiar musical barrier—the fear of playing something that sounds bad—which all too often keeps people from connecting with music from the creator's perspective. 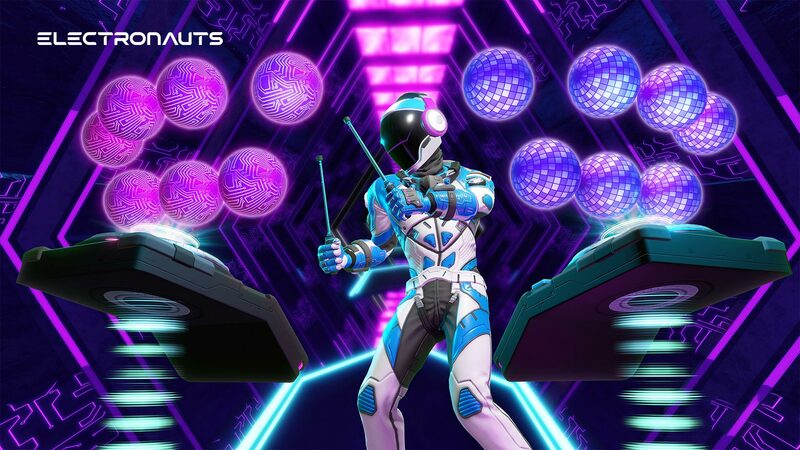 Fans of EDM will find Electronauts to be a totally unique way to experience and interact with music while expressing their inner groove, and those with more musical talent will find a surprisingly capable set of tools for mixing and performing. Sound is such an important (and often overlooked, in favour of visuals) part of Virtual Reality, applications like this that let you manipulate and create sound can be incredibly immersive with great feeling of presence. I’ve had some awesome VR experiences using sound, and look forward to checking out Electronauts as soon as possible. I’m sorry, did you just say “rad”? Sorry I didn’t specify, Sven. EDM is electronic dance music. Ohhhhh…. right over my head! I’ll leave it up to interpretation. It would be a really cool collaboration to see Electronauts music in Beat Saber and Beat Saber music in Electronauts! My idea was playing a Beatsaber map that was being generated live by an Electronaut player. It would be delayed for the Beatsaber player, but that’s just what I thought would be neat. AWESOME idea. Been thinking about this kind of thing a lot. One person makes the beat, the other plays a rhythm game to it. What a time to be alive! Given buy tonight. Very good remix there Ben! And thx for the review ofc. Ok… just had my opening hour.. wow. I ain’t dj or musicIan any sorts… but I like messing around various DAW (reason, cubase etc) so I was intrigued. I very much liked what i saw and heard in Electronauts. It doesnt have any deep sound synthesis and lacking instrument variety maybe but as a starter this package is a lot to take in. Simple but awesome. 9 seems like a valid score. Thanks for coming back to tell us how you liked it! cubase, reason, and ableton are ACTUAL music production tools with real synth emulation and reproduction. This is a beat matched thing for kids to feel like super hero DJs. Could be fun to just bong the sticks around in it I guess for a while. yes it is exactly that. Just a fun experience in VR. Very polished experience though. I have spent another few hours and have to conclude that for those who are into creation this game will fall flat soon enough. Lack of synthesis is a killer imo. Your own individuality and personal touches are not part of the game. But devs never claimed it is anything else but the tool for non-musical persons to feel like a DJs. And they have achieved that. On another note, I can only dream to have a fully modeled recording studio in VR. Just imagine to have 1:1 modeled synths, sequencers, drum machines etc etc. I would pay TOP price for stuff like that. Either way, £13 on Steam for Electronauts is a steal and deffo 10+ hours of fun to have. Even for die hard DAW users, this can be fun experience. My only negative is that all music presented is a cheap EDM. You wont find any interesting electronic music there like Soma, Tresor or some other decent techno/house tracks. Not sure why devs didnt include any Detroit/Glasgow/Berlin electronic music in there. I dont listen Netsky in my free time :) I aint 14 anymore. But as i said, this game is still fun. Techno Ejay in VR lol, a 9? Must be insanely polished or something. Everyone now is DJ teisto because the thing auto beat matches everything at the same tempo so everyone sounds like a musical super hero. I played this a bit and loved it. It’s the first music game that has low enough latency to actually play music (with quantization off). I’m a drummer so all the orbs feel like full instruments to me. Hopefully I can convince a friend to try out multiplayer.